Do you want to be in a pipe and drum band? 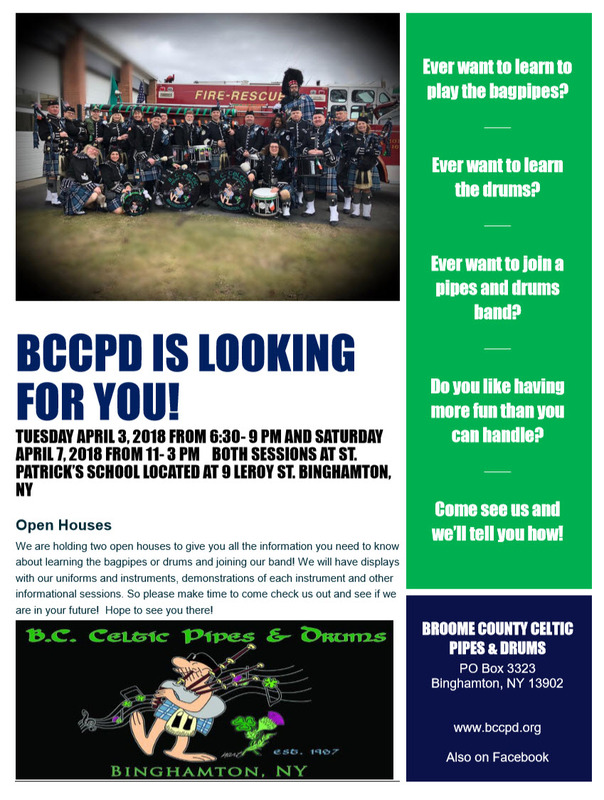 Come join Broome County Celtic Pipes and Drums! Don’t worry if you can’t play pipes or drums because we’ll even teach you! To learn more, come to one of our Open House events April 3rd and April 7th at St. Patrick’s School (enter on the Oak St. side). 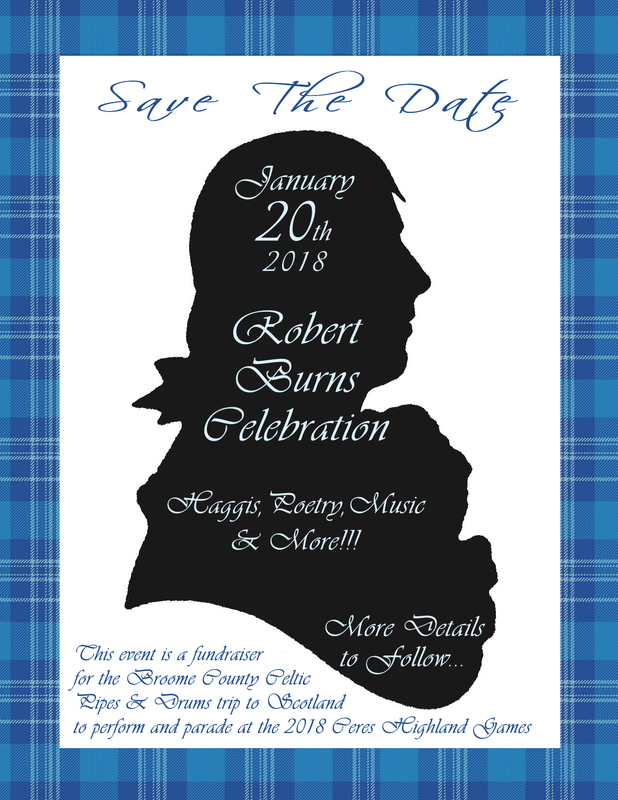 We will once again be having our Biennial Robert Burns Celebration! It will be held the evening of Saturday, January 20th, 2018. More details about tickets and all the fun we have planned will be coming at the beginning of the new year. But for now, save the date! Saturday is coming! That’s when we officially kick-off the 30th Anniversary Tour at McGirk’s Irish Pub on April 29th. There will be a full-band performance at 5pm, but also smaller performances throughout the afternoon. Plus the band will be helping the staff serve and bartend from 1pm-4pm and 6pm-9pm while in tartan kilts! And we’ll have some limited-edition merch on-hand as well. Come have fun with us as we kick this celebration off properly. See you there! Who doesn’t love a great party?! 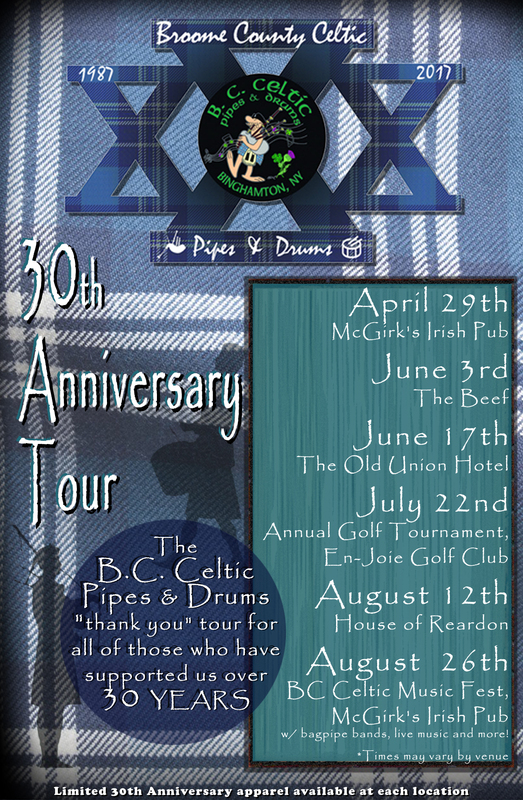 In celebration of our 30th Anniversary, BC Celtic wants to not only celebrate, but have multiple celebrations and spread the love across the community to some of the establishments that have been our biggest supporters during these 30 years. Starting this month we’ll have festivities at these locations, with the grand finale occurring at the BC Celtic Music Festival in August! We hope everyone is safe and warm as Stella has dropped several inches of snow across the Southern Tier. 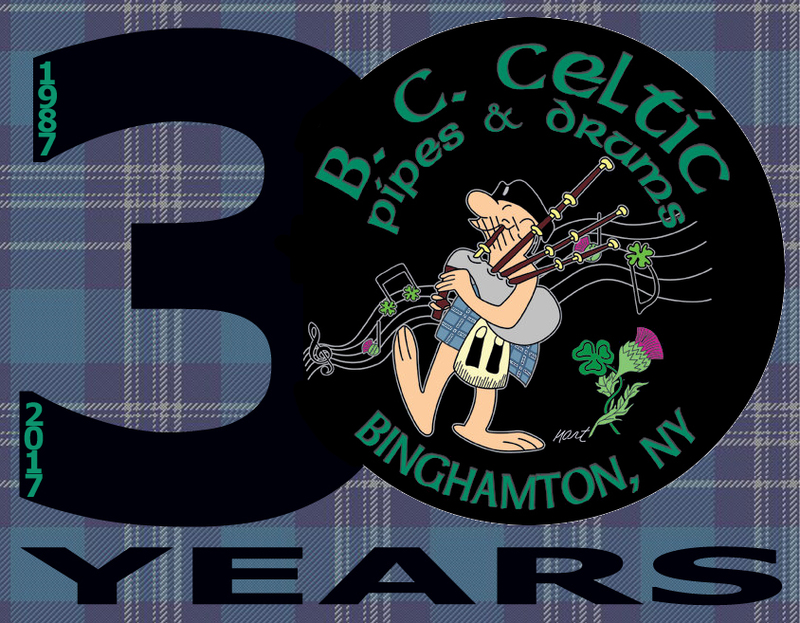 As crews continue to clear the roads for safe traveling and as you may find yourself at home this evening, turn on News Channel 34 and check out the special report on Broome County Celtic Pipes and Drums! We’ve been informed it will be a two-part special airing tonight at 6pm and 11pm (part 1), then tomorrow night at the same times (part 2). Then join us Friday as we spend St. Patrick’s Day at several local venues! Thank you so much to everyone who joined us for the Great Guinness Toast! But we’ve only just begun. Parade Day is this Saturday. We’ll be kicking off the Friday before Parade Day with evening stops at the AOH, The Beef and the Binghamton Firefighters Pre-Parade Day Party. Then on Parade Day, we lead the Parade at 1:30pm, perform at Seton after 3pm, then we’ll be making stops at Abel’s, The Old Union Hotel, the Parade Day Party at St. Patrick’s Church, and McGirk’s Pub. 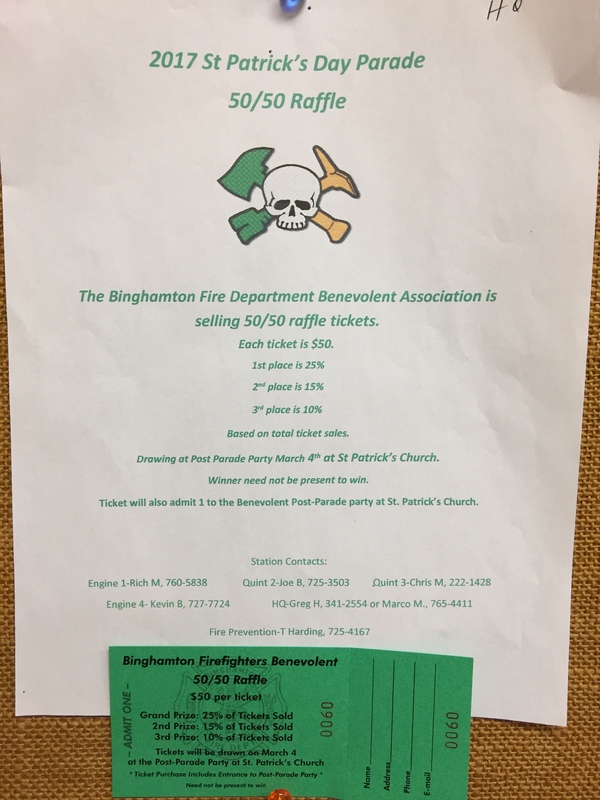 Please take a look at the Binghamton Firefighters Pre-Parade Day Party flyer, and the raffle info for the BFD Benevolent Association, if you would like to participate. Rest up this week and see you this weekend! The season is here! This one is extra special because this is our 30th Year! And to kick it all off, Friday February 24th we will be celebrating the Great Guinness Toast! 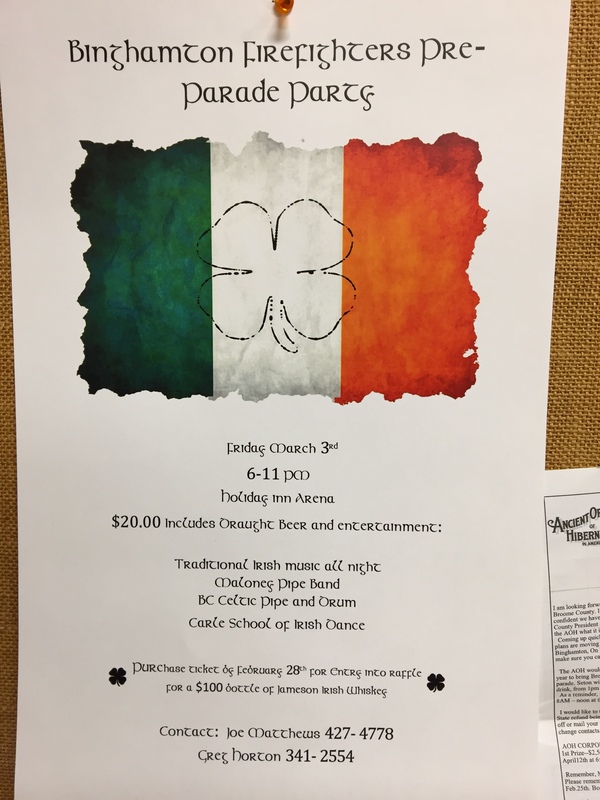 This event is once again organized by A.L.George, and BC Celtic will be providing the tunes. Come to one or two, or make a whole evening of it. We guarantee it’ll be good times.